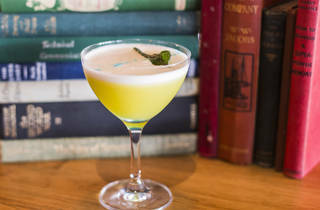 A neighbourhood hangout in Angel from the Callooh Callay team. Lately the London drink gods have been rewarding us with bold neighbourhood bars that shake more than just an espresso martini. Little Bat has just swooped into Islington, bringing with it expertise from the team behind Shoreditch bar Callooh Callay. 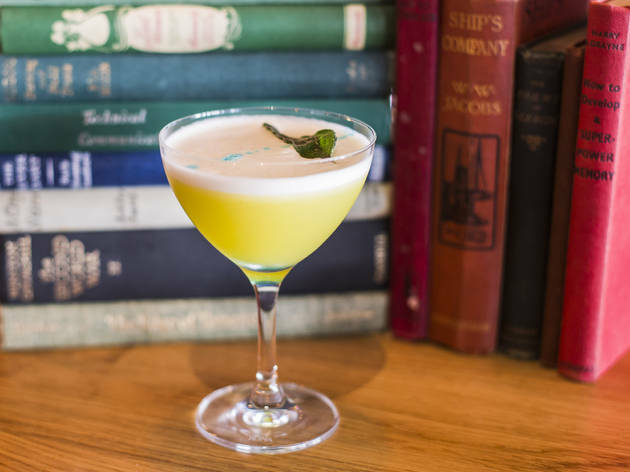 Unlike a bat, things are hardly flipped on their head here – aside from the bar’s name, the ‘Alice in Wonderland’ gimmicks of Callooh Callay are absent – but perhaps that’s advisable in this less edgy ’hood. Instead it’s like an extensive library, with the best seats at the rear: deep armchairs and sweeping semi-circle banquettes in jade leather. The place is not entirely quirk-free, though. You’ll find a photo booth on your way to the bogs, proof that Islington isn’t afraid of a few post-tipple lols. I tried a Rhubarb Swizzle (£9.50), a sweet, long drink with a pleasant tart twist. No offence to the Swizzle, but I wish I’d ordered what my friend was knocking back: the Pan Am Cocktail (£8), a frothy blend of rum, Aperol, lemon, syrup, bitters and egg white that had her grinning like a Cheshire Cat. I suggest heading here before dinner in the area, or else just get comfortable and order in; pan-Asian food from Ziloufs over the road is available for snacking, although we stuck with complimentary popcorn. Staff were overly attentive, but an eagerness to please in the early days is hardly a drawback – it’s far more than you’d expect from its insouciant Shoreditch sister bar. Best of all, and again differing from Callooh Callay, Little Bat has stuck with neighbourhood prices. So it’s more cutesy than bloodthirsty, a hangout that offers character and cocktails nous not often seen in this area. Fangs for that, drink gods. Having opened in March 2016, Little Bat is the latest from the Callooh Callay family. A cocktail bar in Angel (54 Islington Park Street, N1) with a great food offering, we have a true atmosphere of hospitality. Funky bar with interesting cocktails. Amazing service, atmosphere, drinks... couldn't ask for a better venue! Outstanding little niche bar tucked away in a busy area. Quality staff, quality drinks, quality evening there. I didn't try the food, sounds like I need to go back for the food!! I had some banging cocktails, one blue little number that came with a miniature rubber duck floating in it, I kid you not!! I love the fit-out job (having previously been Public House), it's got some great areas on offer, perfect for quality cocktails with friends and a great new addition to Upper Street, just right for a night cap. This review doesn't mention the food! Don't order food in - order from the menu and enjoy. It's a very well thought out clever set of cute dishes and bigger stuff. What a great addition to the Highbury Corner / Upper Upper St neighbourhood. And, their new food menu is to freaking die for.